Fun Things — "Shirley Temple in an Alley Fight...."
My favorite boys and I live at the Bomb Factory in Dallas, TX! Black meets Girl Interrupted meets Friends. Click here to see the New York Times review of Nickel Mines. I hope someday, everyone gets an opportunity to see this incredibly beautiful show. I am so proud to be playing "Terri" in the NYMF production of Nickel Mines, based on the 2006 West Nickel Mines School shooting that occurred in Lancaster County, Pennsylvania. Written by Andrew Palermo and Shannon Stoeke with music and lyrics by Dan Dyer playing at The Duke July 27-31st. Click here for more info about the show, the creators, and how to support this very relevant, revolutionary piece of theatre. I am honored to sing with fellow Broadway artists on May 20th at the Young Survival Coalition's "In Living Pink: The Art of Survival." Click here to get your tickets or participate in the fine arts auction. All proceeds go to YCS, the premier organization providing resources and support for young women affected by breast cancer. Midtown Direct Rep (MDR) concludes its 2015-16 Theater in the Loft series at the South Orange Performing Arts Center (SOPAC) with a staged reading of BLINK, written by Kate Moira Ryan and directed by Mark Armstrong. We shot a time-lapse of putting up our Christmas tree just in time for Thanksgiving! Singing at 54 Below with fellow Broadway actors for Artists for World Peace. In honor of "Day of the Girl," all contributions go towards building a safe house for women in India. Please, click here to donate! 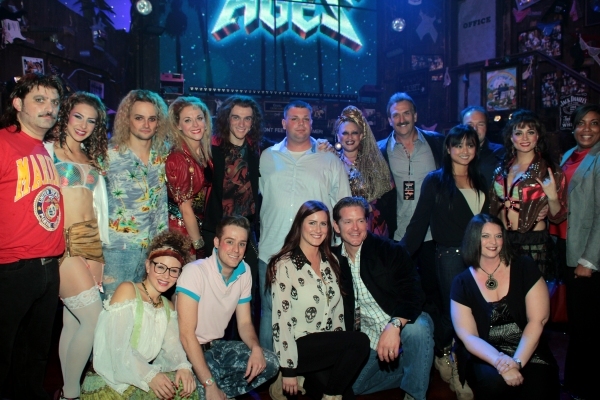 Rock of Ages performs with Mayor Bloomberg at the Inner Circle 2013 show. Cassie Silva, Cody Lancaster and myself help celebrate St. Mary's Children's Hospital by rocking out in Times Square! St. Mary's serves 4,000 children a day, the largest special needs hospital in New York. Click here to give to St. Mary's! Rock of Ages is lucky enough to support The Boot Campaign. The Boot Campaign is a grassroots initiative started by five women from Texas known as the Boot Girls. The campaign encourages everyone to “get their boots on” providing an easy and tangible way for Americans to show appreciation for troops, cultivate awareness of the challenges they face upon return and raise funds for military programs meeting the physical and emotional needs of our heroes. Rock of Ages wins the Broadway Softball League Championship for the second consecutive year! Rock of Ages at New Years Eve in Times Square! The Boot Campaign, partnering with Benchmark Mortgage, returns to ROA to surprise Purple Heart recipient Jon Moldovan with a mortgage free home. Rock of Ages performs and answers question at Islip Middle School, winner of NPR Long Island Teacher Appreciation Award. Rock of Ages does shots with Guy Fieri! Rock of Ages helps Guy Fieri open his new restaurant, Guy's American Kitchen and Bar, right next to the Helen Hayes Theatre on 44th street in Times Square. My hair hero, and fellow Stephen King fan, Dee Snider, and I rocking out. Production Photos from Rock of Ages Toronto and Broadway! Sports stars make their B'way Debut! 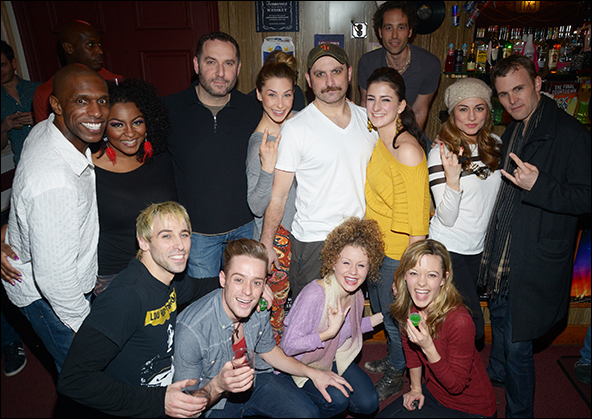 Yankees first baseman Mark Teixeira makes his Broadway debut with ROA! 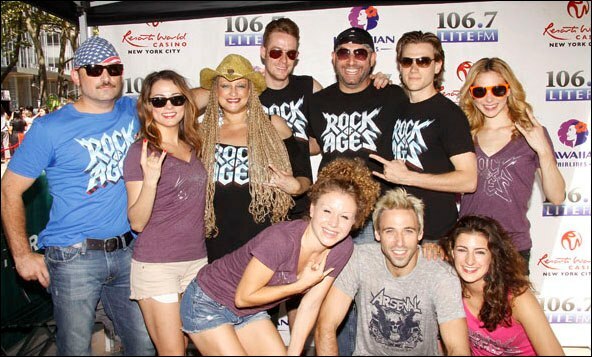 Rock of Ages breaks a record! OA celebrates becoming Broadway's 50th longest running show! Jimmy Fallon loves Rock of Ages! How the Grinch Stole Christmas on Broadway!